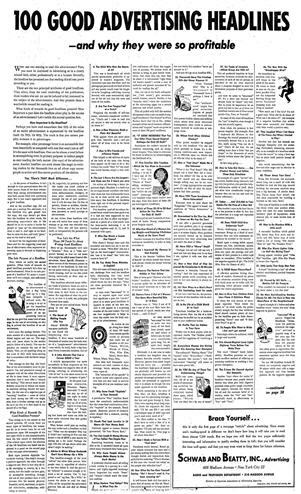 100 Good Advertising Headlines (1-megabyte PDF) This is a 3,000+ word ad, so if you choose to print it out, you’ll need larger paper or just use the magnifier in your PDF Reader. As I am curremtly reading Victor Schwab’s book How to write a Good Advertisement I would highly recommend adding these headlines to a person’s swipe file. They are the same ones he discusses in his book which I am finding very informative. Love this blog! Can you PLEASE add an RSS feature to it, so I can get my whole team to follow your posts? Great blog and thanks for the tips, seen some of these before but not al of them. Thank you Best wishes in life, love,business and health, Eddie, The Guy In Charge. though it’s not so apparent because of the missing RSS button in the sidebar. Thanks for alerting me. We need to keep in mind, these headlines are failures in todays marketplace. The drive and ideas are always valid, but the wording is as dry as the paper it was first printed on. Use them, but better to avoid copying. For example, the word “Now” has a negative influence on sales. And “not”, in any form. I’d put my money on many of these time tested headlines over any you’d strained over. Or how about one of the top selling self-improvement books in history, “HOW TO WIN FRIENDS AND INFLUENCE PEOPLE,” which was both an advertising headline AND the title for Dale Carnegie’s book, which *still* sells in 2009 after a 70 year run. Are there some duds 50 years after this collection was written? Are you qualified to make the blanket categorization that these are all failures? What a gold mine of information you have shared here. Let’s go ahead and let some folks believe they don;t work. Okay? There… I just eliminated the competition for us all that realize this stuff is PURE GOLD. Thanks for sharing it Lawerence. Your blog is great resource for anyone struggling with sales copy. I plan on using your blog as a one-stop shop when I start to produce my own infoproducts. I’ve been studying the great copywriters recently and they all say that the headline is the most important piece of copy. Now I have 100 of the best to model and adapt to my purpose. Thanks! Great blog..information is priceless..I will use these as a baselines for ad testing when appropriate..google adwords provides ab testing. There’s some great stuff on this post. I went on an advertising design course a few months ago and a few of these cropped up. It’s just a matter of taking the calls to action or pertinent points and adapting them for your own industry. Not coming from a marketing background, rather a web design one, this kind of thing is very useful. Love it. Cheers! I recommend this to everyone. It’s copywriting gold! These headlines are a great inspiration. Where and when did that ad run? Thanks for the article. The headline is the hardest part. I am constantly struggling to put together a good headline. Thanks and as usual…love the blog and always full of pure gold. I was looking for something like this for a long time. Thank you so much for putting this together in an easy to read way. This is definitely a must-have for anyone who starts to do online writing. Do you mind if I put it in .pdf and share it with my students? Thank you so much! Excellent information. I took about 40 examples that apply directly to my project. Thank you! Excellent, I love it. Thanks for your effort and gift. It help me a lot to organize my ideas. @Lawrence Bernstein: Thanks a lot Lawrence! I appreciate your generous help to our students. As a matter of fact, I will recommend your web site to them for copywriting study. Because you have so much great stuff here! Thanks for sharing this. It’s a great source to inspire one’s ad copy. Just scanning/researching for a new project and restumbled onto your site. As to not being relevant today killer points Lawrence and I see these headlines being used successfully today in fact on the weekend was the “heres what Doctors do” running in a local paper by a chiro. Sure times change, technology changes but human nature never will and these timeless headlines go for some underlying emotions that unless your “Buddha” most of us have! Cheers for the killer resource you have here. Thanks, Richard, glad to help! Huh??? Eh?? Obviously, for those of us acquainted with the “modern-day” use of these headlines, this guy can’t back up his comments with testing! Many of these headlines have worked for thousands of companies who are/were willing to use them or to change up the nouns and verbs, but keep the essence and structure of the ad the same! Don’t believe this guy’s remark! Believe those of us who know firsthand that they work. It’s Gold Jerry, Pure Gold I Tell Ya! Thanks for that great collection of headlines. They are very much relevant and effective today as they were when they were first written. Fantastic Blog – just what I was looking for, really struggling with a catchy title for a newsletter. Have bookmarked the page so I can use it again. I’m in awe! So much to study on this site! This is an amazing goldmine! I really really really really really hope no one in my city knows about this site. Is there a way to block your site in West Texas, except for my IP address, of course. Thanks for sharing and thus setting the example to share. Wow! I’ve had this article bookmarked for many years and always find it a useful resource. The psychology behind the headlines is where the magic is. Hi Ruben, I rarely use “LOL” but this time I will because I did. LOL! Good point about the psychology of the headline. Another one, and it’s more sophisticated, is speaking in the language/parlance of the prospect. Sometimes, it’s hard to glean this from the headline alone. These are all really good headlines and Ideas. I actually have used some of the ideas given here to help me make money doing just that advertising on craigslist. Not only promoting my website but advertising simple listing items that I was selling. You can make a lot of money simply by posting ads and getting people to click on them. I’m not here to promote my website or even my product but if you would like some simply ways to making money with ads you are more than welcome to check it out!! Yes, these headlines are powerful. I use a few of them in Twitteclicks and I’ve already gained 500% growth in my followers. Thanks. I was provided this blog URL while obtaining my MS in Internet Marketing. Today I came back to reference the read, and it’s just as excellent as ever. Hmmm! awesome information here, I am writing a business flyer and brochure for n MRI company and I will be using the advice here. Whether it has been old or new, if it works. Use it. “Failure is only a chance to begin again” try a different approach is all I say. First up, Lawrence GREAT Blog! I use Call NOW! …in my sales message AND it works like GANGBUSTERS! And “not”, in any form. I use “not” …UNDERLINED in my sales letters AND guess what? YES! it works like GANGBUSTERS! @CMasterson YOU are a MUPPET…!